While it would appear that contractors are not affected by the liabilities of the work of others, it is important that they understand the documentation that establishes culpability and the terms of restitution. 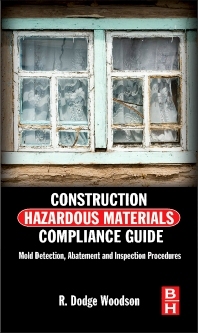 A "boots on the ground" approach to the pre and post construction inspections as well as all activities in between, Construction Worksite Compliance Guide: Mold provides expert time saving tips to ensure that the job is done right the first time and according to state and Federal regulation. In this book, Woodson shares over 30 years of real-world experience for planning and monitoring the daily work activities on mold contaminated worksites. Packed with checklist, tables and "quick lookup" materials, this manual provides a step by step approach for monitoring workers who are performing the activities specified in a mold abatement work plans.